Reading and writing skills were once confined to only a few people. Today, a person facing problems with acquiring literacy skills will run the risk of being excluded from fully participating in society New information tends to imply even more demands on mastering reading and writing than ever before. Dyslexia was used early as a descriptive term for characterising problems of reading and writing. Since the introduction of the term, research has made impressive progress and interdisciplinary fields have been created including social studies, behavioural studies, biology, education and remediation. Above all, dyslexia research has taken a step from being descriptive to suggesting theoretical models for explaining the empirical phenomena observed. This book presents contributions from some of the world leading researchers on these issues in honour of one of the main scholars in the field, Professor Ingvar Lundberg. 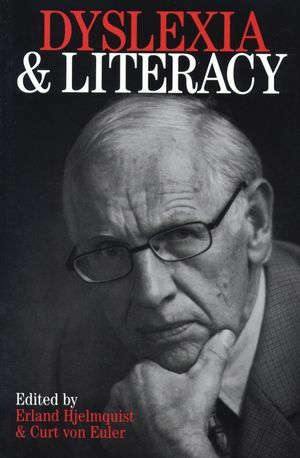 Erland Hjelmquist and Curt von Euler are the authors of Dyslexia and Literacy: A Tribute to Ingvar Lundberg, published by Wiley. Dyslexia - how it Started and some of The Steps on The way Toward The Present, Curt von Euler. Literacy in the Past Millennium, David R. Olson. Reading Disabilities Among Very low Birth weight Children - Implications for Using Different Exclusion Criteria in defining Dyslexia, Stefan Samuelsson. Word Recognition - The Impact of phonological and Orthoraphic Components, Torleiv Hoien. Components of Reading comprehension as Predictors of Educational Achievement, Carsten Elbro and Elisabeth Arnbak. Shadows Over Phonological Training - Resistant Learners and dissipating Gains, Pekka Niemi and Elisa Posliparta. Phoneme Awareness and reading - From The old to The new Millennium, Richard K. Olson. The Reading rate Deficit of German Dyslexic Children has Little to do With Surface dyslexia, Heinz Wimmer and Heinz Mayringer. Phonological Processing in Learning to Read Chinese - in Search of a Framework, Che Kan Leong and Li Hai Tan. Persistence of Phonological Deficits 20 Years Later on - a Revisit of Lundberg's Sample of Poor Readers, Ake Olofsson. Neuromagnetic Correlates of impaired Reading in Developmental Dyslexia, Paivi Helenius and Riita Salmelin. Culture, Brain and Dyslexia, Uta Firth. The Role of Genetic in Understanding memory, Lars-goran Nilsson. Twenty Five Years of Reading Research as a Basis for Prediction of Future Development, Ingvar Lundberg.